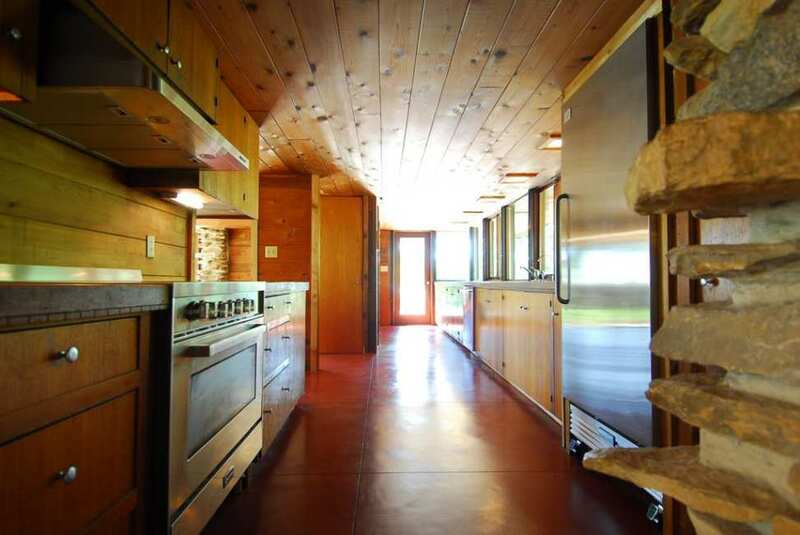 This 3 BDR, meticulously restored organic Usonian mid-century modern home, inspired by Frank Lloyd Wright, sits on a serene 2 acre lot in a quiet town surrounded by evergreen trees, fruit tree orchard and a 1/4 acre organic garden with raised redwood beds. Updates in the last 3 yrs include: Prof. installed cypress roof w/50-100 year shingles, concrete floors with radiant heat, electrical, plumbing, insulation, windows, appliances, and a rebuilt atrium. 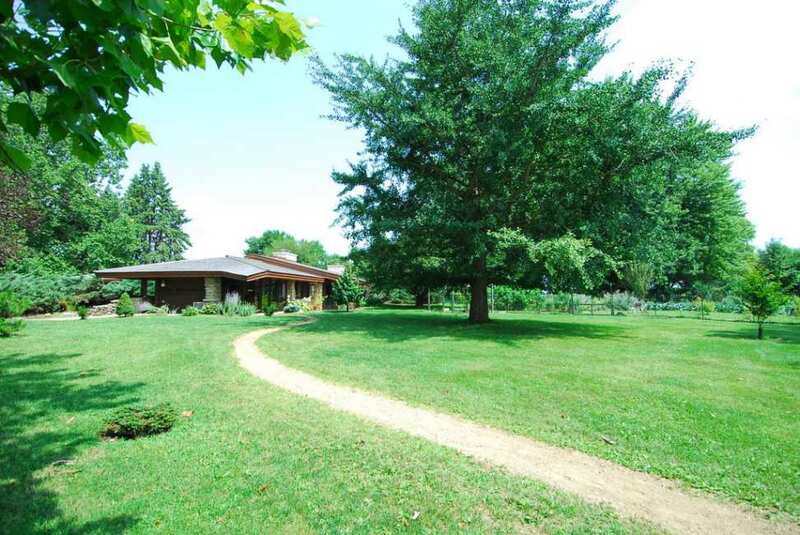 This property also includes a separate 500 sq. ft heated studio that has a concrete heated floor. Other nice upgrades include a full house water filtration system, underground drainage pipes around house and LED lighting throughout. The modern Triangle Tube SS modulating natural gas boiler operates at 96% efficiency which makes for monthly avg. gas bill of $100. Quality upgrades have been done for you and will last for many many years. Too much to mention so come take a look for yourself. Again, this style isn’t for me but it’s still easy to appreciate the architecture as art of the house. I was thinking the same. This place is spectacular…. 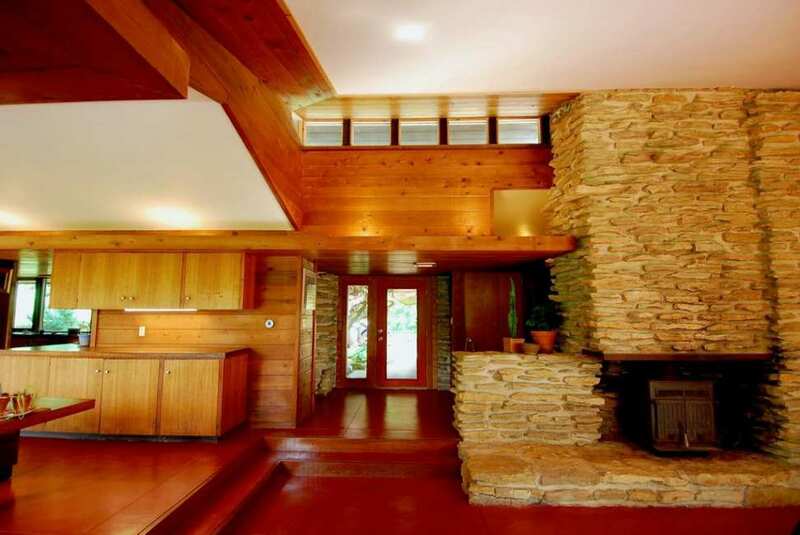 the Mad Men fan in me would love to have a place like this to host parties with mid century modern themes! Oh. My. God. My dream house!!! Stunning! I’m from Illinois and I’ve never heard of Polo, but this is an amazing house. It’s just north, north-east of Sterling, IL. Beautiful area. Phew…not a speck of paint. Thank God. This is amazing and worth every dime asked. Thanks for sharing it! ohmygosh. Takes. My. Breath. Away. Only possible change for me would be removing the woodstove from the main fireplace which I’m sure was a later addition. The glass. The wood. The melding into nature. The serenity. Want, want, want. Wow. Love this style. Polo is about 11 miles from my house and I have never seen this home. Nice weekend ahead; I just may try to find it. 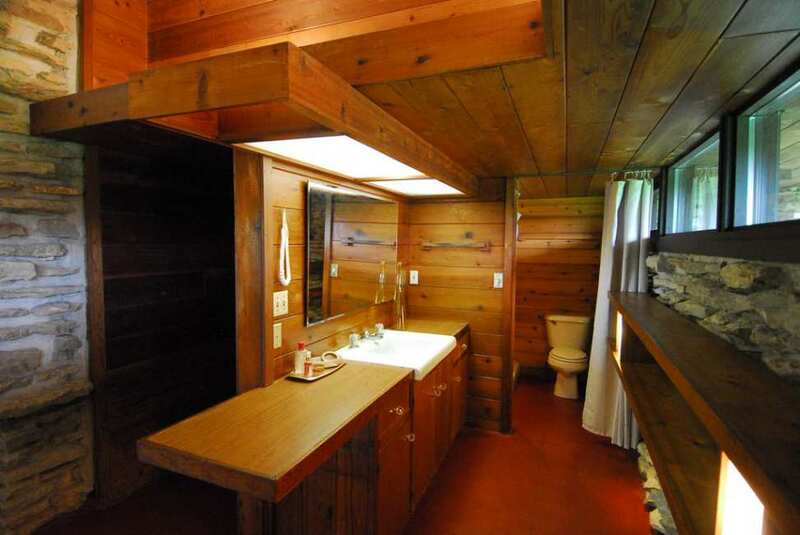 What a perfectly preserved Usonian! Wright-ish for all the right reasons. Wonderful textures and light. This looks like the house in the Netflix show The O.A. So not my style, but I’d live there in a heartbeat! Complete perfection, wouldn’t change one thing. I knew Polo back in the day, a little farm town a couple hours west of Chicago, fairly conservative and dull. 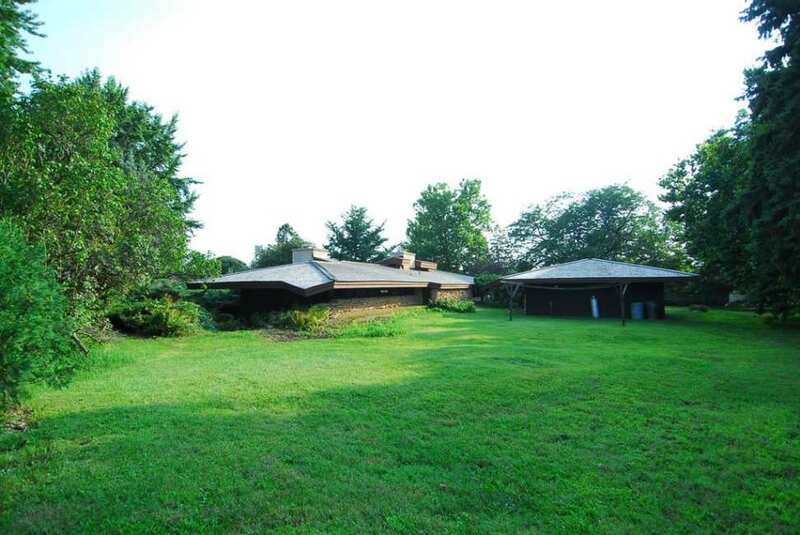 This is a fine modern house that at this price maybe needs to be transported to a suburb somewhere. 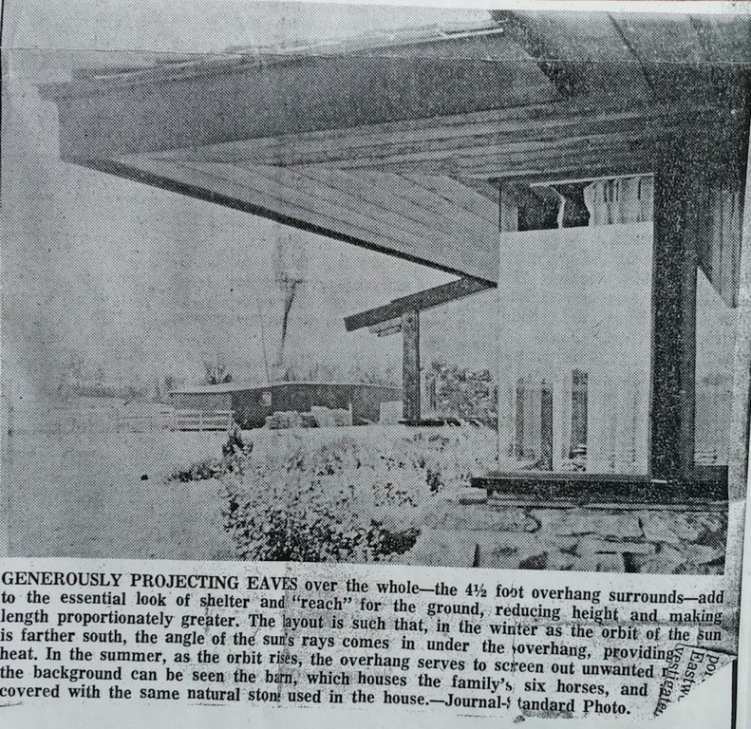 I wonder if they still have the great family style Sunday breakfasts at the White Pines Park down the road – pancakes, eggs, bacon, ham AND sausage, in an NRHP log lodge. Then a slow, happy walk through the forest. NW Illinois has some surprisingly beautiful places! White Pines still has the amazing Sunday brunch. Very reasonably priced. Worth a road trip! That’s great to hear! Haven’t been there in a very long time – brunch was like $3! I’m buying my lottery ticket first thing today. If I win it’s MINE all MINE!!!! I love it. I’m stocking it with Matt Helm, old James Bond, and iIn Like Flint movies, and martinis. Very funny and true. 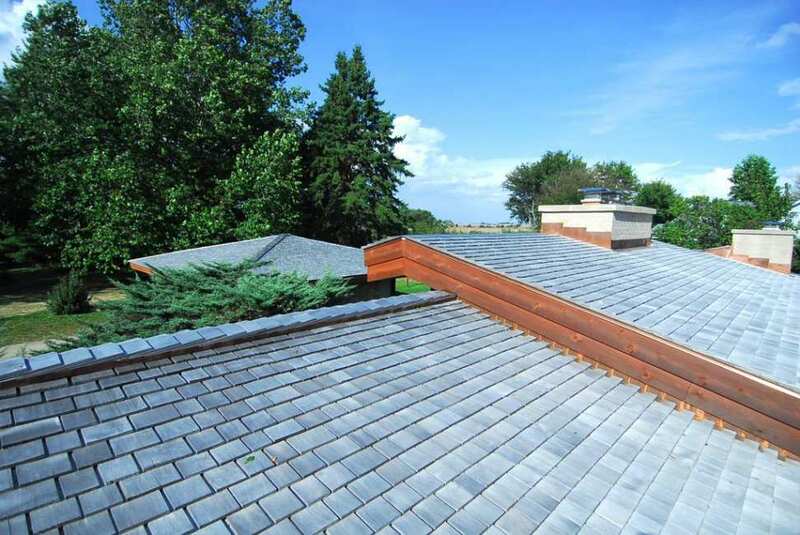 This house is amazing,the roof is so different than anything I’ve every seen. 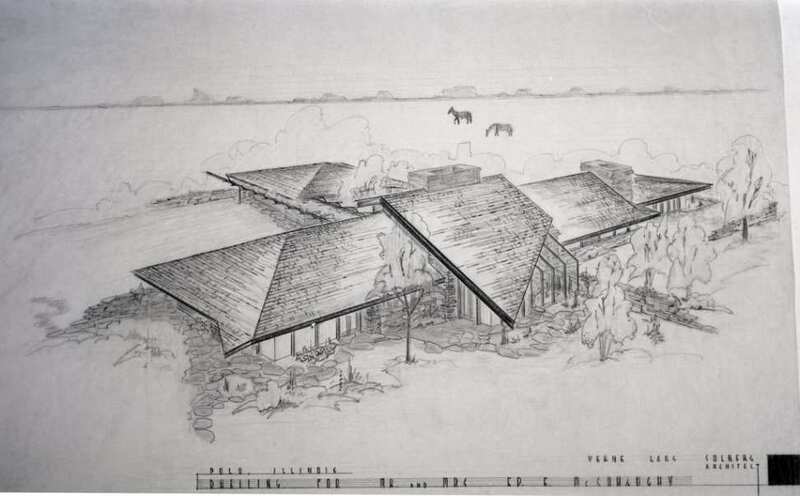 Wright knew his stuff. Love this! 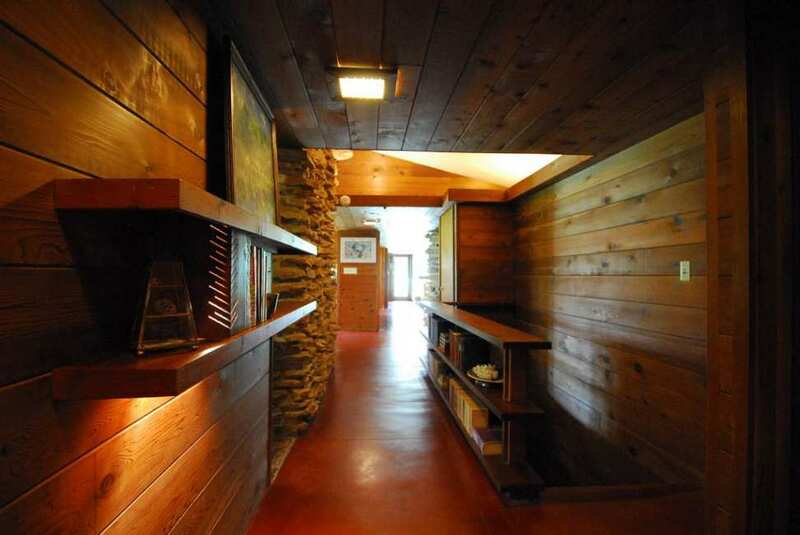 I think this is a wonderful blend of MCM and Usonian. 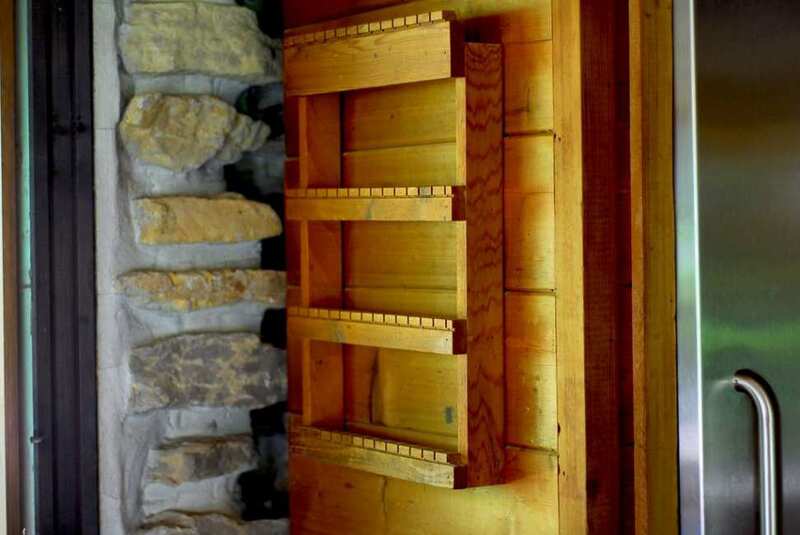 The stacked stone is amazing. 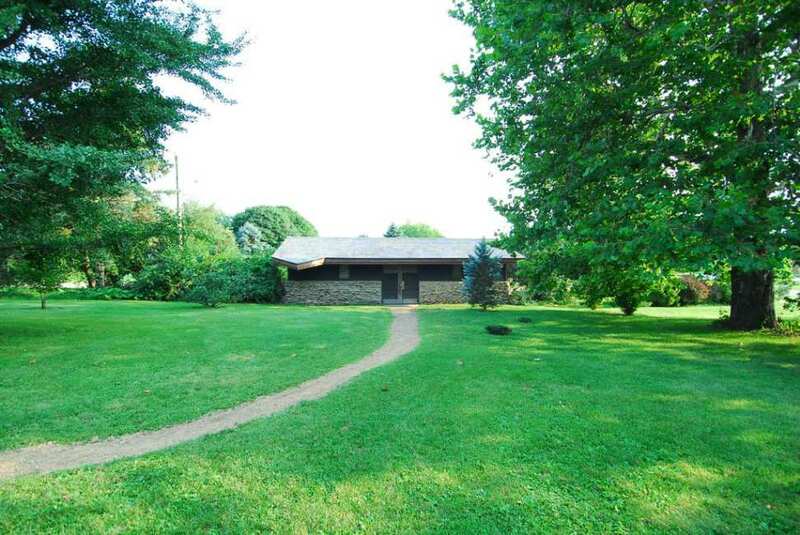 I would love to create a MCM landscape around this place to complete the perfection. Does anyone have any idea what the red floors are made of? Is it red cement? 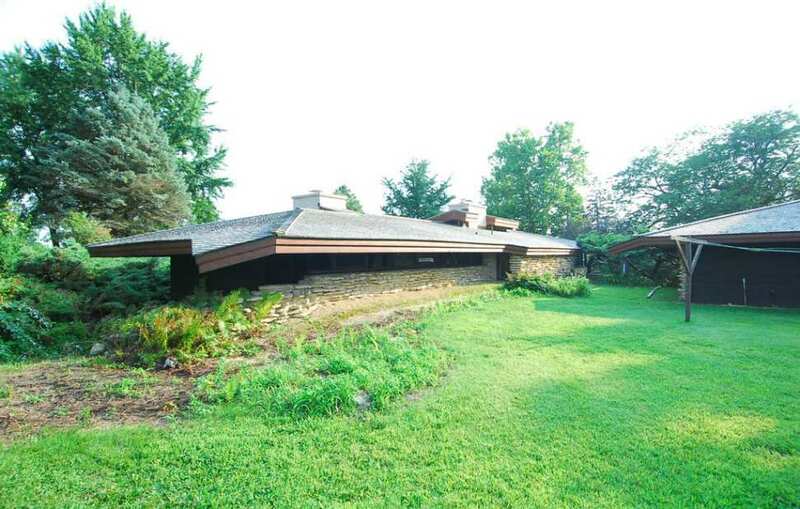 of Frank Lloyd Wright houses, especially the Usonian ones. The are pigmented concrete, which is then polished after the concrete is floated. I believe the reveals are added in before the concrete cures. The powdered pigment was broadcast dry & floated in, this gave the floors their mottled appearance, rather than adding the concrete tinting powder to the mix, which would appear more monolithic. 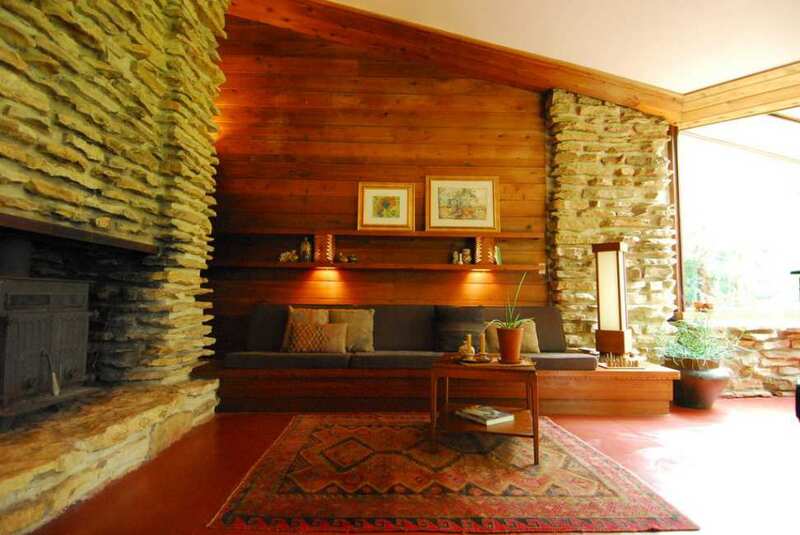 This is how is was usually done, its possible with this home, the color was added to the mix. After the floor is polished and cured it can be waxed & buffed. 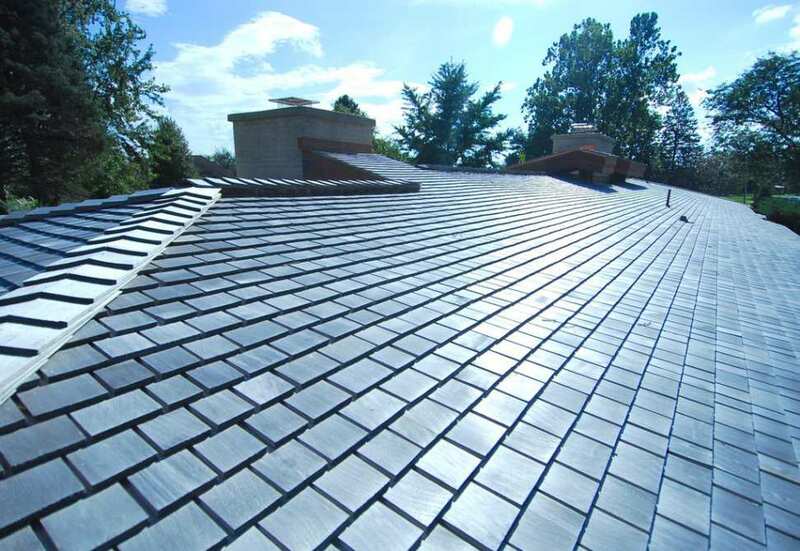 It’s a great finish, especially nice when the slab is warmed by radiant heat. Beautiful, but not ready for the zombie apocalypse. 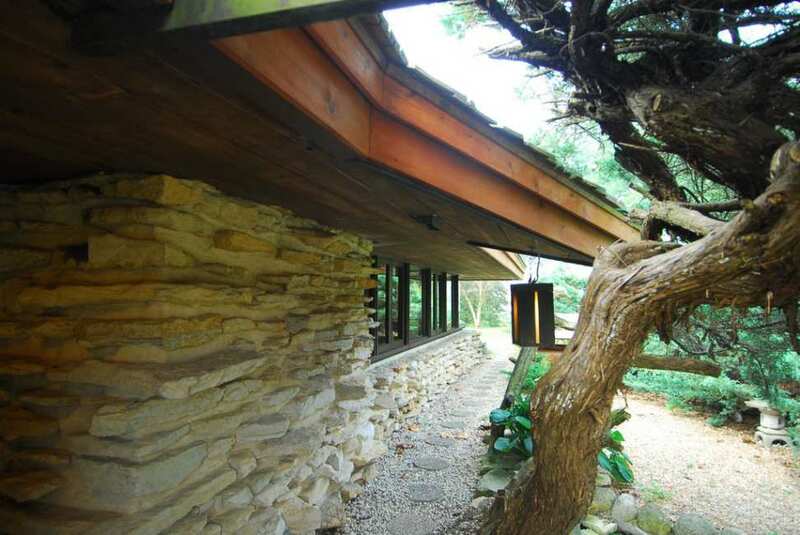 In all seriousness, one of the Wright-style designs that I think is quite charming. My wife would LOVE to own this one! 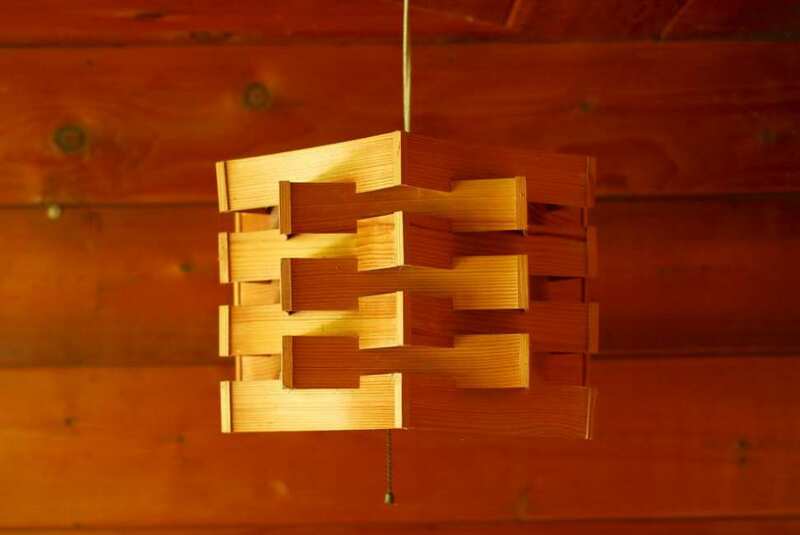 FLW is one of her favourite architects! Thank you for sharing! I volunteer to wash the dishes! LOVE IT!!!!! 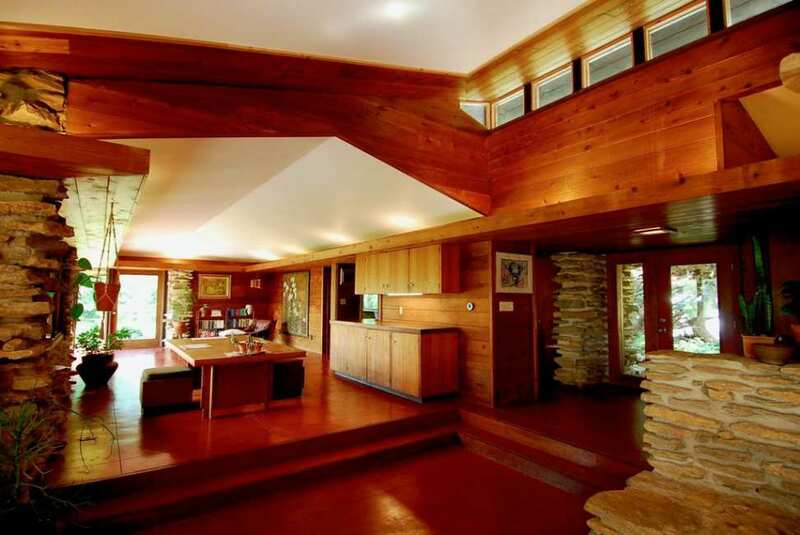 Not sure if I could handle the winters in Ill.but would sure try for this great home.The red floors look like the vinyl that was popular then,might even be that Asbestos tile.At my age I would even live with that! 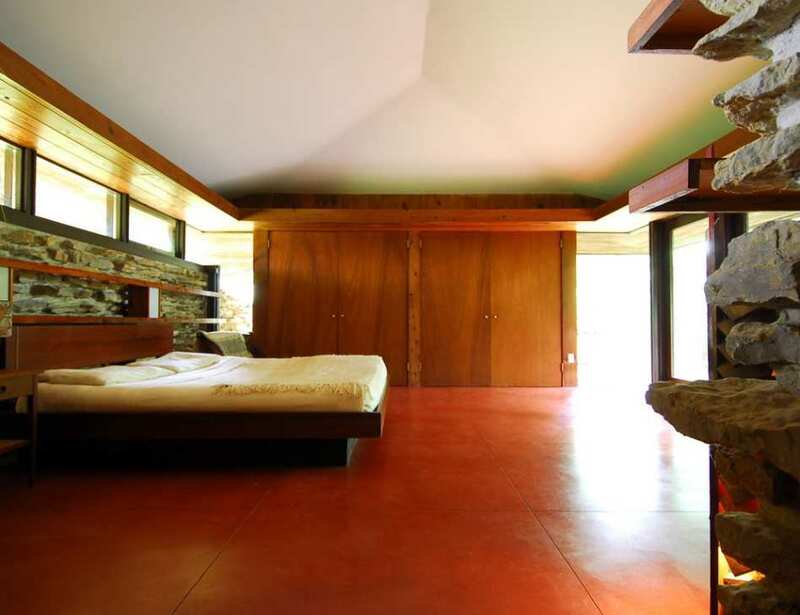 Floors most likely of stained, scored and polished concrete; a common choice for homes of this style and era. 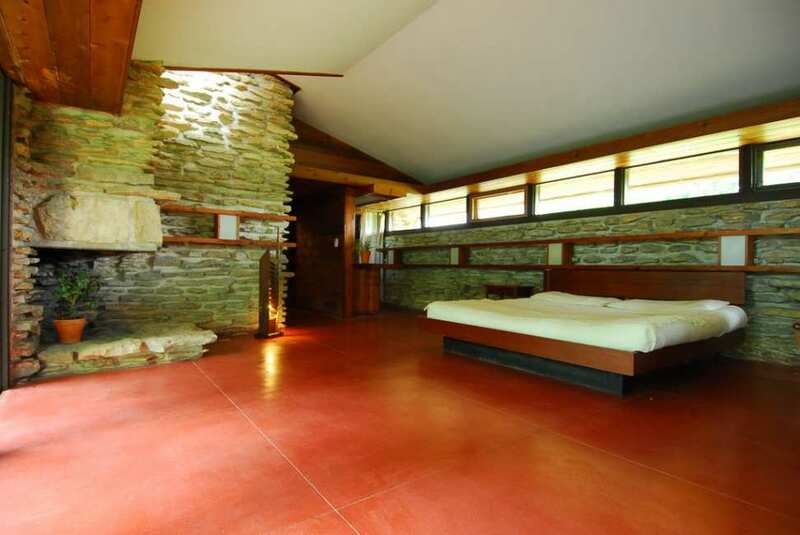 FLW used stained cement for his floors often. 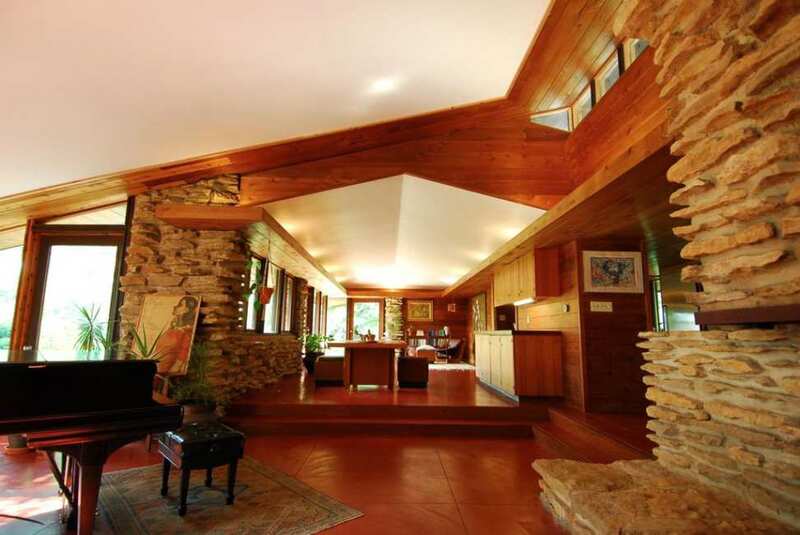 This looks exactly like others I’ve seen, in fact the one FLW house here in Oregon that we toured has the same floor. The docent explained how it was colored before being laid–never needs painting.. The color he chose was ‘Cherokee Red’ (or something nearly those words). He liked it for the warmth and unity it brought to the space. You’re spot on about the Cherokee Red! So breathtakingly beautiful. A work of great craftsmanship. 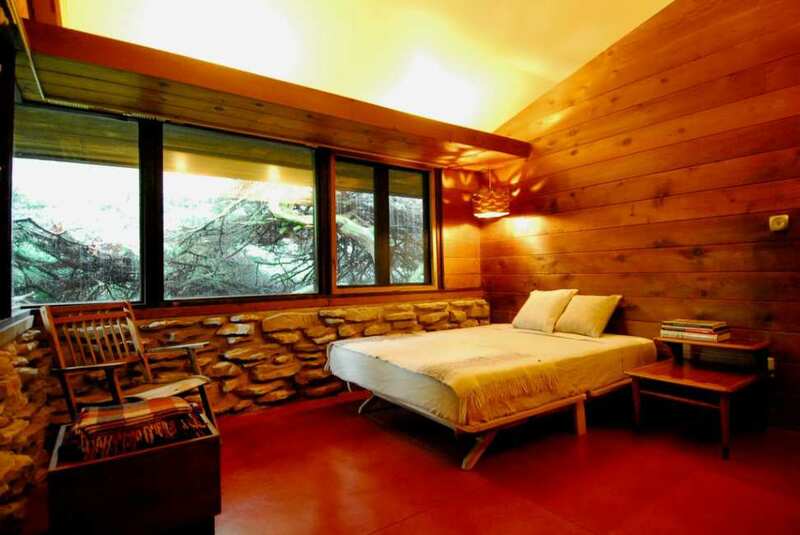 As a recent and ardent convert to mid-century, this place is off the hook. Illinois is too cold for my old bones. If you see anymore mid-centuries, I hope you will include them. Thanks as always for the best Site on the Web. Wow. Just wow. 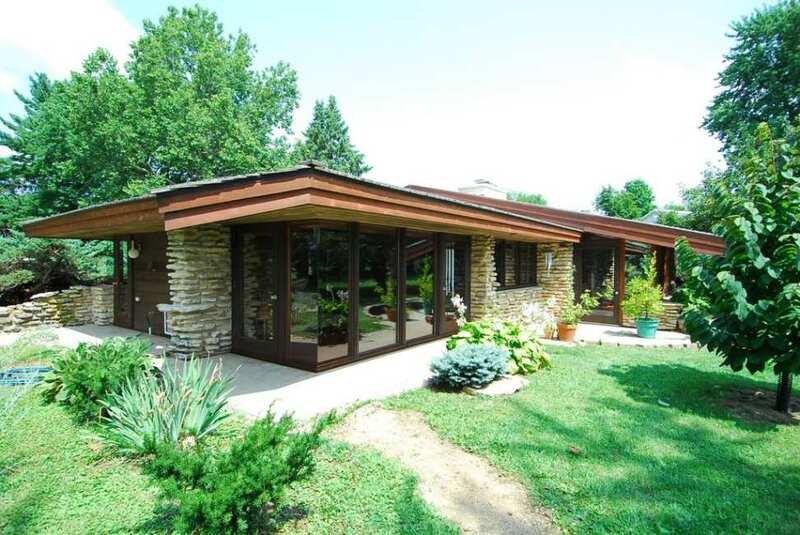 I, like Tommy Q, am a convert to mid-century through the efforts of my husband. I owned an 1898 mansion and loved every minute of bringing it back to life, but this home speaks to my heart as a nature lover. Not only a masterful work of art, but so naturally live-able. And, yeah-I’ll fight you for dish-duty! Paddles. I need paddles. LOVE this house SO much! Oh, this one is SO cool. FLW must have bit his tongue about that. I’m usually not a big mid century fan, but this one is the bee’s knees! And it’s not in the middle of nowhere. Full service hospital in Sterling, shopping in Sterling or Dixon. What’s not to like? The area has been on hard times for the last 30 years and it’s not close enough for Chicago commuting, so it will have to be a buyer of established means who loves the area for what it is. As I said, very tempting…..
What an amazing home! And thank you Kelly / OHD – I learn something every time I come here. I don’t even like this style but I adore this house. Furthermore, I adore it as is. I wouldn’t even buy much furniture to put in it. I may have to start buying a lottery ticket every week! 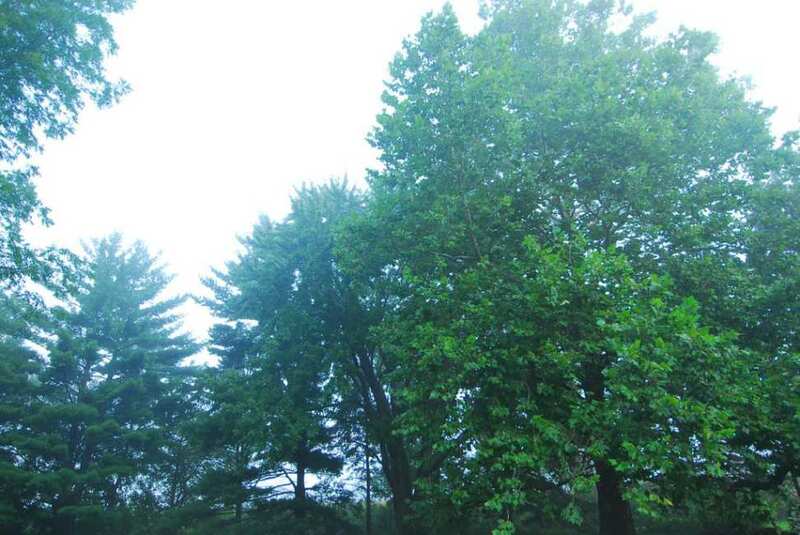 LOVE this property! 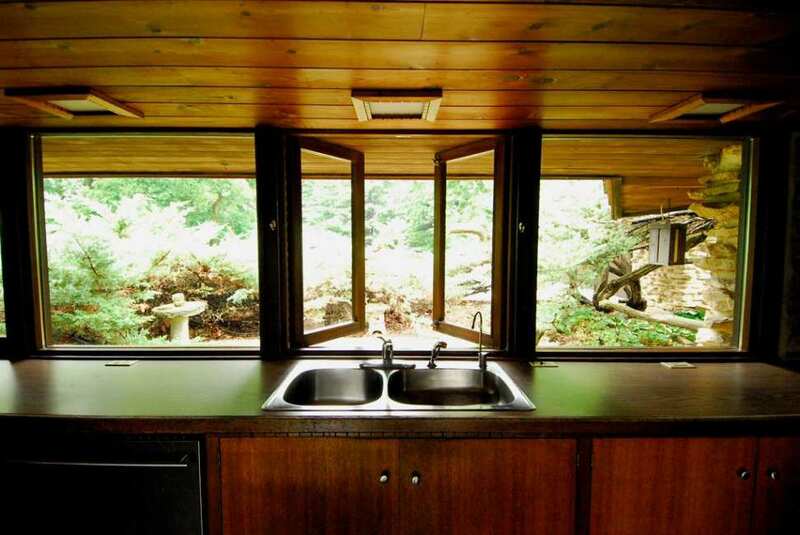 What a kitchen this house has! Like some of you I am not a fan of this style but I really admire his use of space, the flowing lines of his designs and most of all his ability to incorporate natural elements and the “outside in” so seamlessly. I’ve saved this forever. lol. 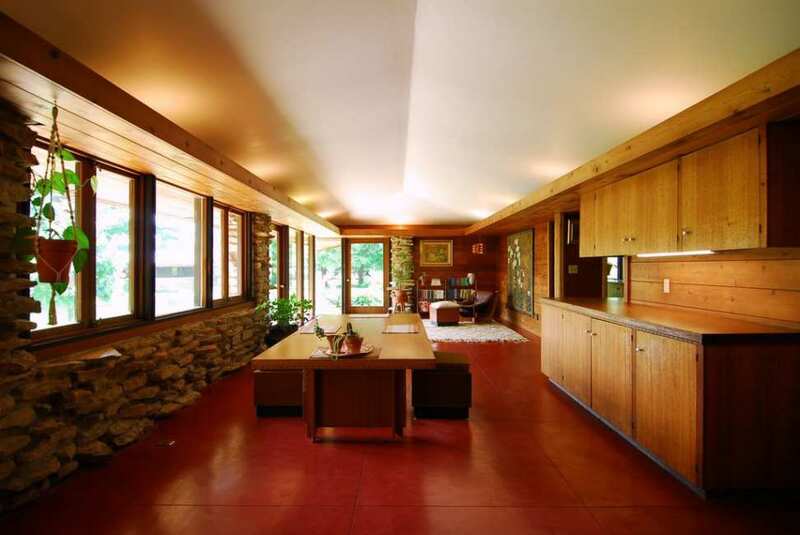 It is a blessing that the sublimely beautiful, Cherokee red, tinted, concrete floors remain in their untouched, glorious, original condition. 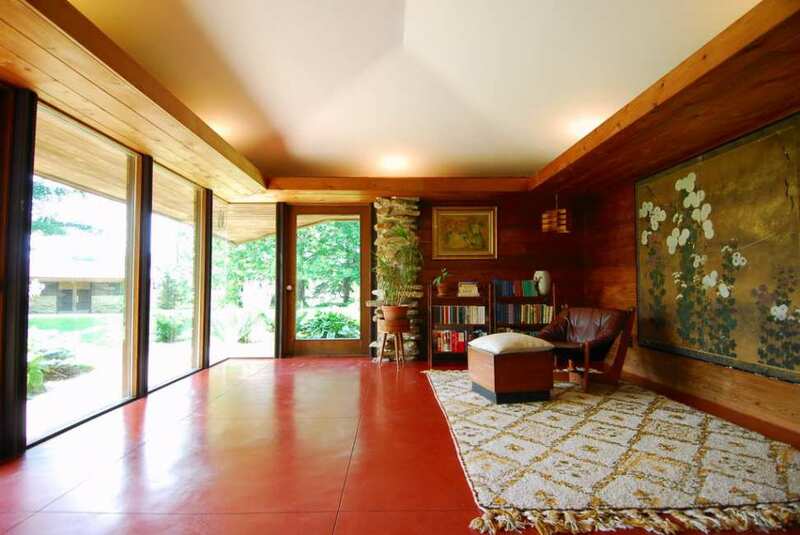 Such a thrill to see this house mostly in the raw without the distraction of many furnishings or rugs to cover the lustrous, rich floors; or otherwise distract from the beauty of the gestalt of materials and composition. The house is a gorgeous gem, there is no question. 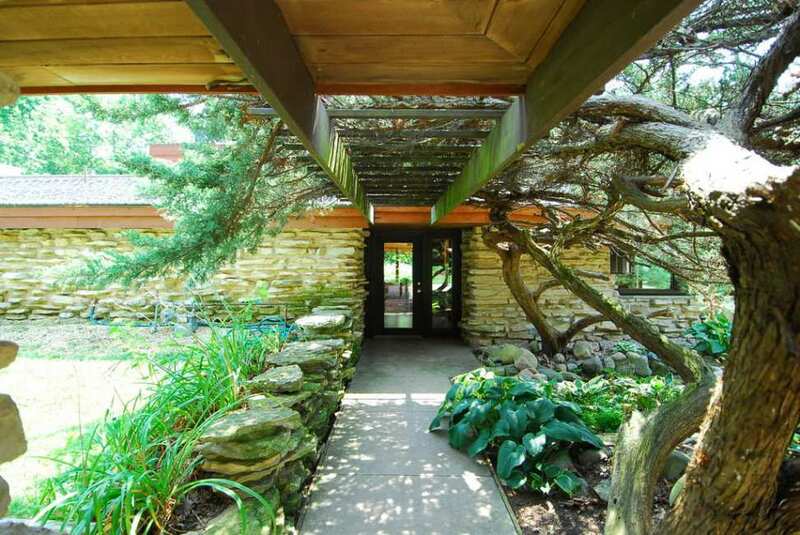 There is also no doubt that it encapsulates all of the design aesthetics Wright espoused, and his methods of composing them, down to a T. My only criticism is that the actual architect who designed this structure has completely copied each aspect of the design from other Wright designs and has brought absolutely nothing new or original to the composition. 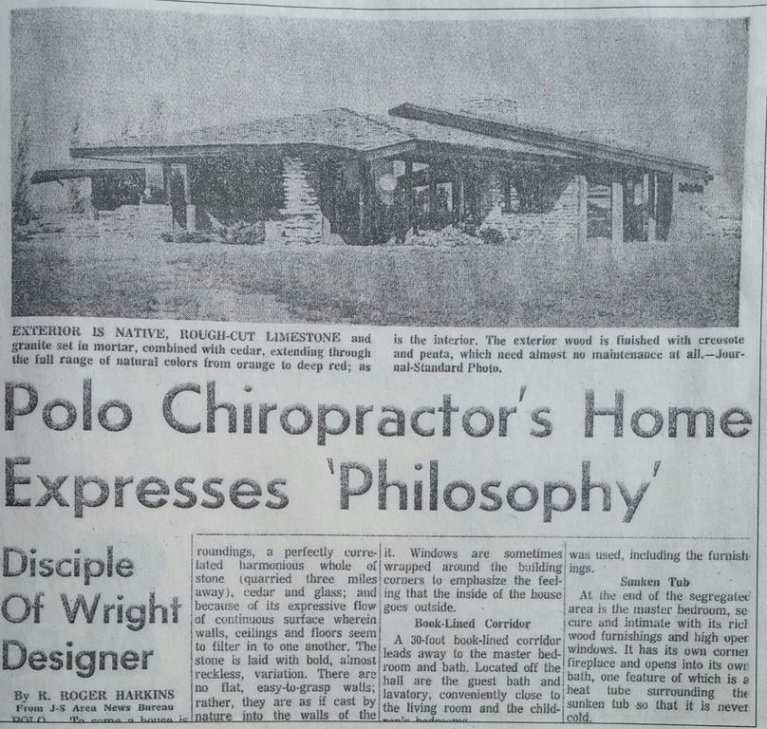 Of course Wright himself wouldn’t have minded in the least; and the original owner probably asked for “a Wright house” so he didn’t care. Who was the architect? Who cares. 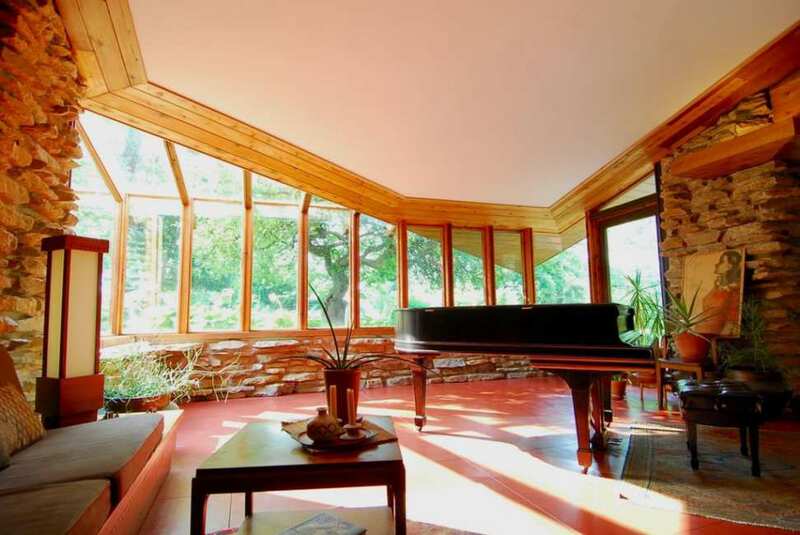 The architect was Verne Lars Solberg (1924-1992), who studied under Bruce Goff, and was a fan of Wright, obviously. 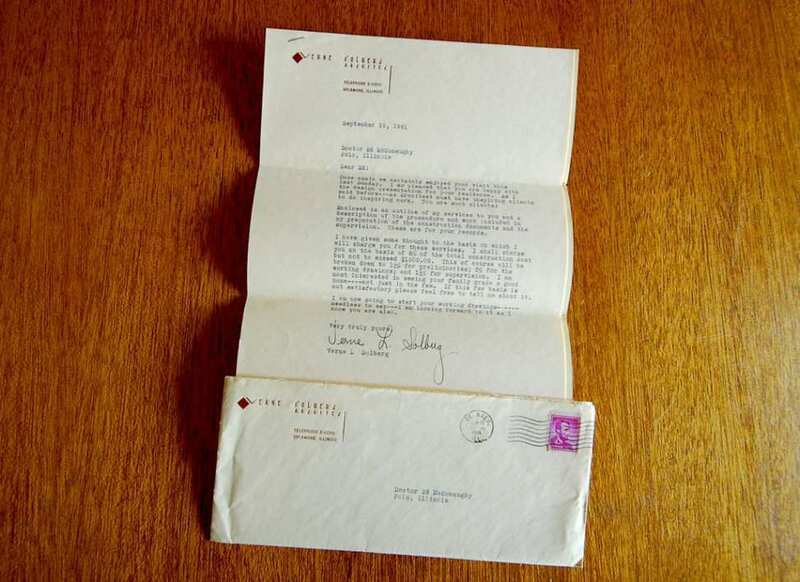 He was given a lot of latitude by the client, his friend Dr. Edwin McConaughy. 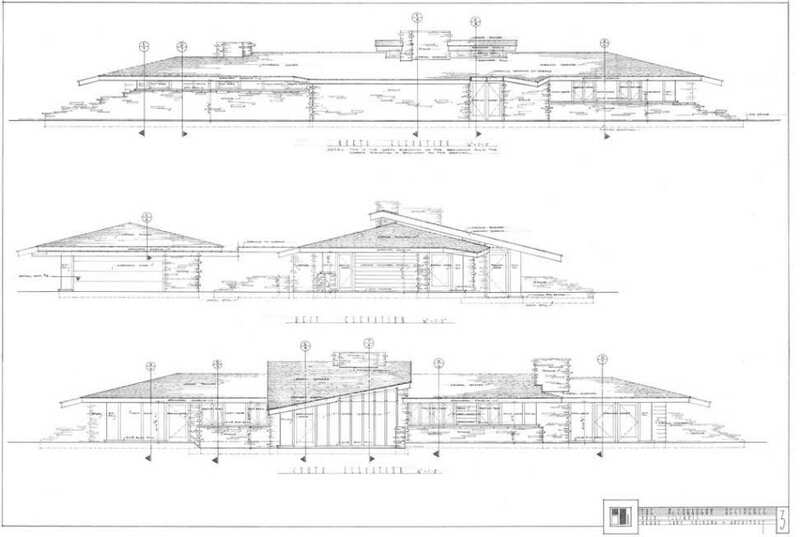 I think it’s a good design by a local architect, and even if he borrowed a lot from Wright, he still had to put it on paper and get it built. 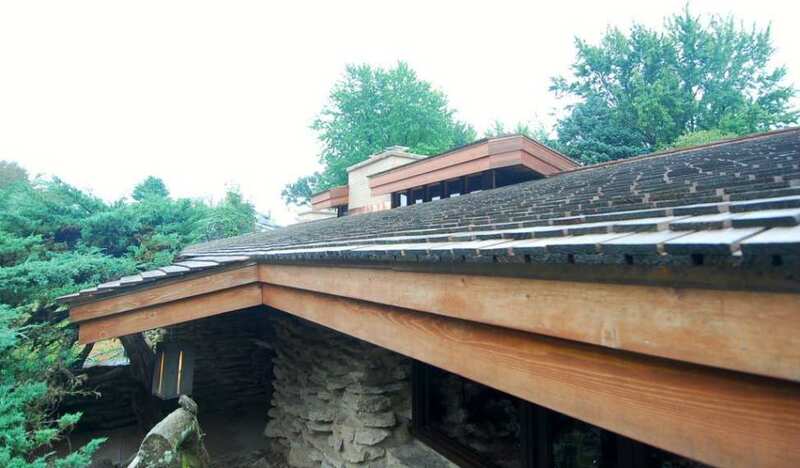 It says a lot about the influence of FLW that his ideas from years earlier were still current into the 60’s. That and the pristine condition of the place makes it special. Huh. Interesting. Wonder why the article posted refers to him as a “Disciple Of Wright” if he studied under Goff? Weird. 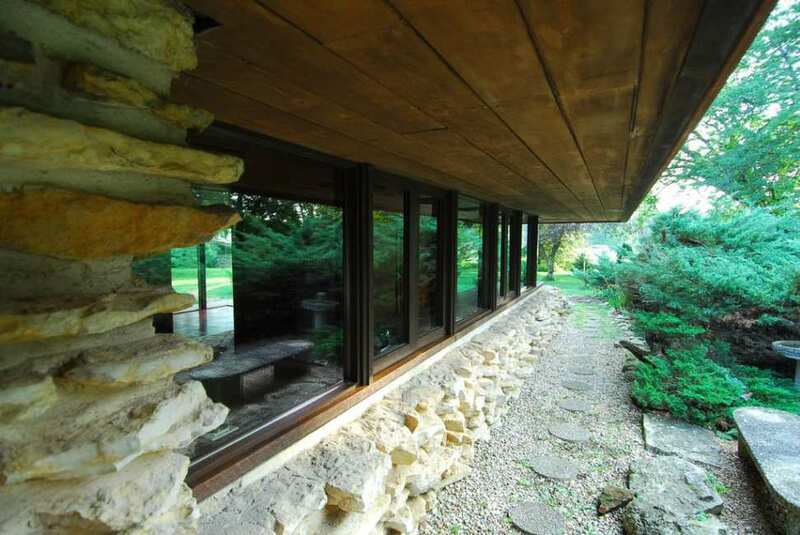 This place is for sure all Wright; and there doesn’t seem to be a hint of Goff IMO: perhaps the use of the irregular, rough stone; but even that –. 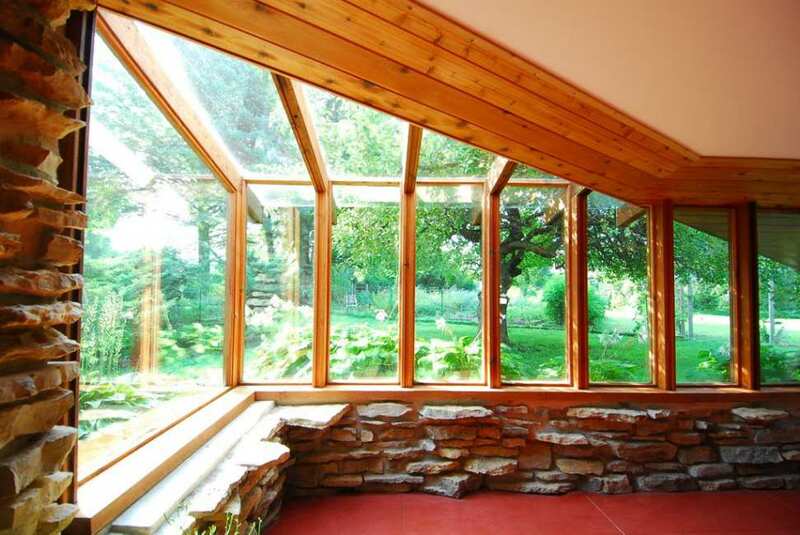 IMO this house is 95% Taliesin, and 5% Auldbrass. JimH, thanks for getting in a mention of the actual architect. 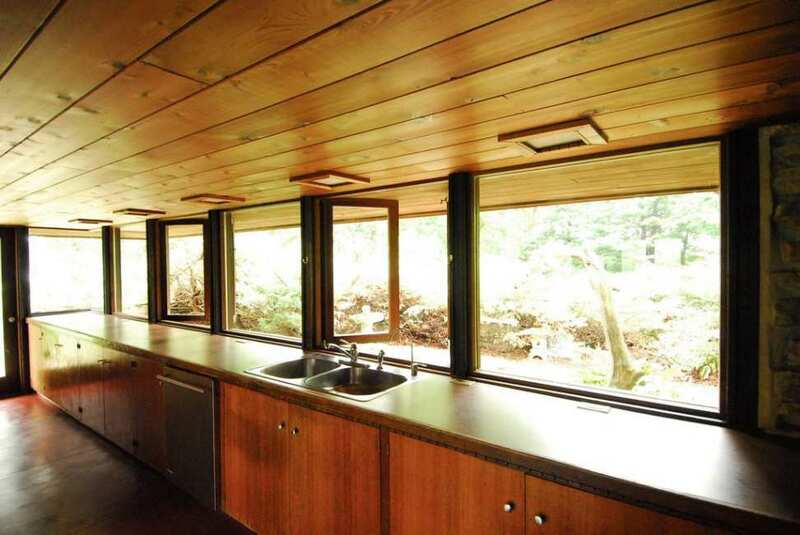 I imagine the original owner did want a house that looked like it was designed by Wright, and Solberg complied. I have no problem with that. And Rosewater, just a guess here, but Solberg may have revered Wright but studied under Goff because that made sense at the time he was in school. (I’ll have to read up more on him to see what I can find out.) Studying under someone doesn’t necessarily mean you’ll be a lifelong disciple of that person. 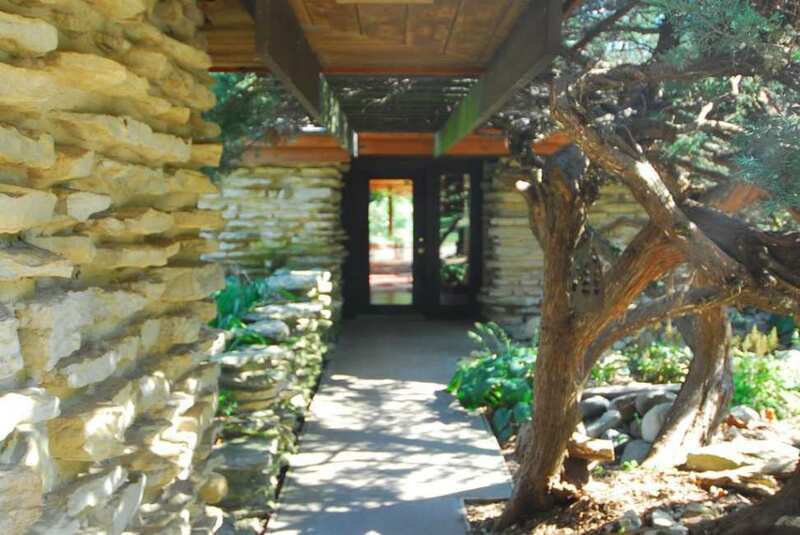 When an architect is referred to as “a disciple of Wright”, in the past, that has always meant that that person was either a Wright apprentice, or studied with The Taliesin Fellowship. Let me know what you find out after reading up. Apologies—I didn’t realize that “disciple” has that specific usage when one refers to Wright. I simply assumed that the generic non-Wright meaning, “a convinced adherent of a school or individual,” was meant. I’ll watch that in the future. I read all they did during restoration. It is amazing. Makes me sad that with all they put into this home it has had to be reduced. 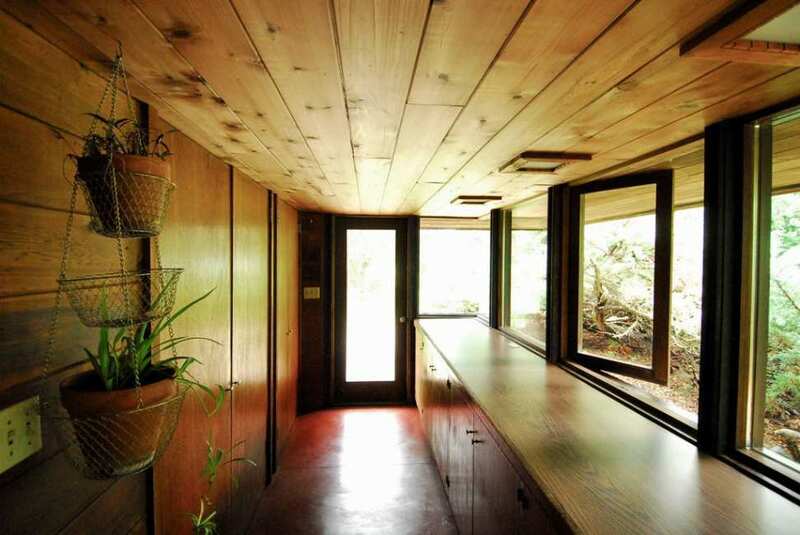 This is a perfect home for someone that works from home (which is many people now) or an artist/writer/designer etc. I think people in general are so focused on an abundance of amenities that places like this get overlooked. 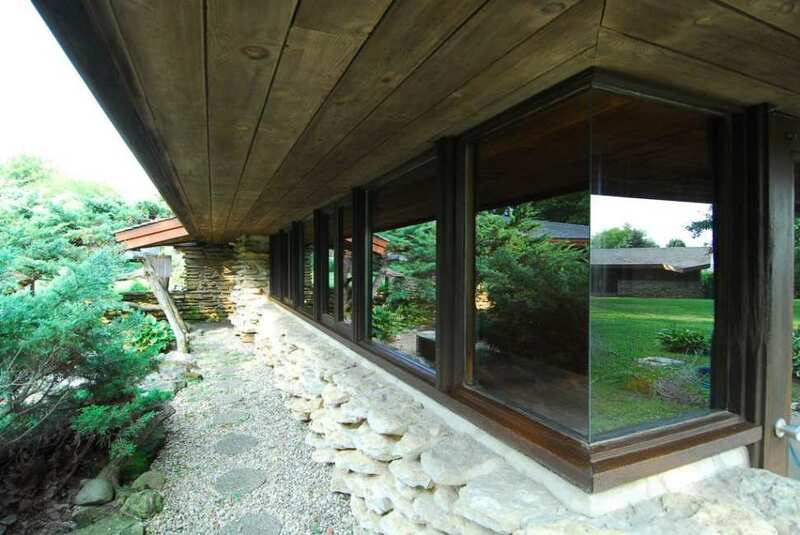 I work from home Sue and usually have no problem with focusing on work but at this house, I would surely be spending work days awestruck with my jaw on the floor. This home is mesmerizing perfection. Would love to be holed up here in a blizzard. One of the nicest Usonians I’ve ever seen. 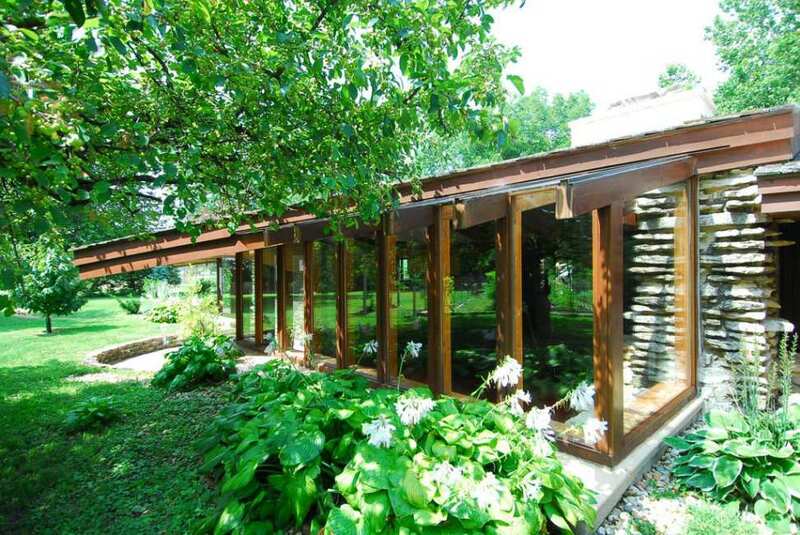 This is soooooo *not* my style but it really is a gorgeous and interesting house! 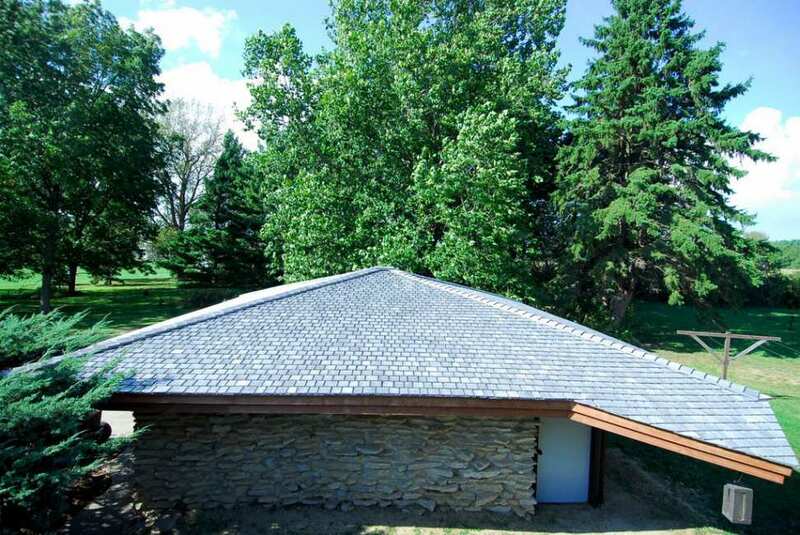 In the owners’s summary of all the work done on the house, included is new concrete floors with radiant heat… such a great amenity … both concrete and tile can get really cold in IL winters! What a super cool house! Fabulous home! 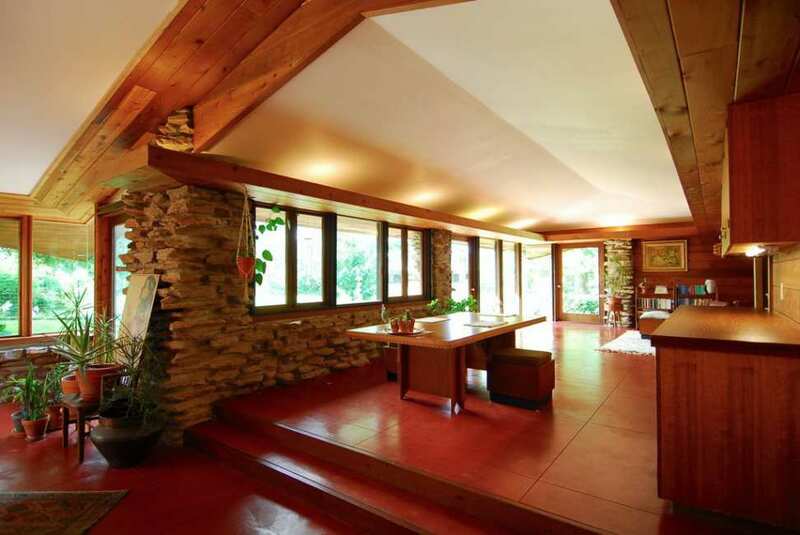 Love the FLW influences and I think the architect did a remarkable job being true to Usonian elements. I dig any style/ period that was well designed and built. This beauty was is no exception. My reaction tallies with that of so many commenters—I normally am drawn to old federal and Georgian houses but simply love this house and would happily live in it, spare furnishings and all. I don’t care in general for modern, find 1920s and 30s houses mostly stodgy and uninteresting, find Victorians too fussy—ah, that’s it! 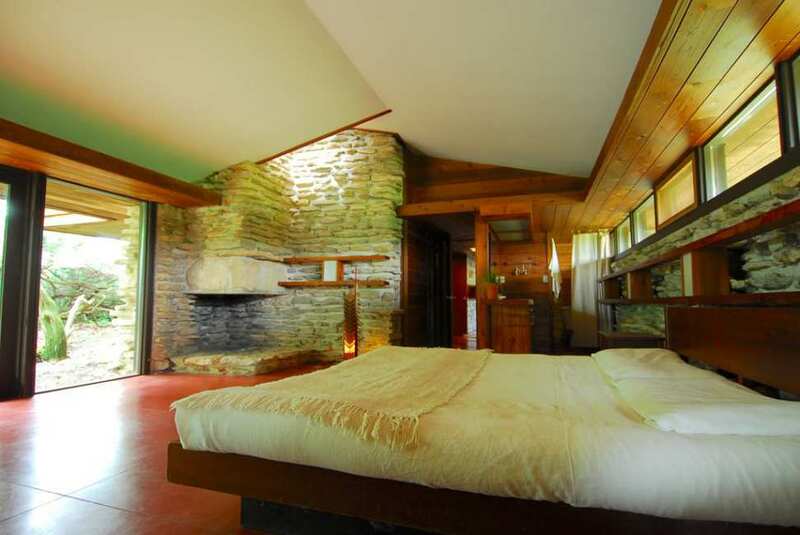 It’s the simplicity of really old houses and the very different simplicity of FLW and adherents’ houses that evoke similar responses, even though the houses themselves are so wildly different. Thanks for posting this one!